We are aware that a video was posted last night depicting a Prospect student threatening another student. We also know that the video has been widely shared, and several students have expressed – both publicly and privately – how angry, shocked, and upset they were by what they saw. 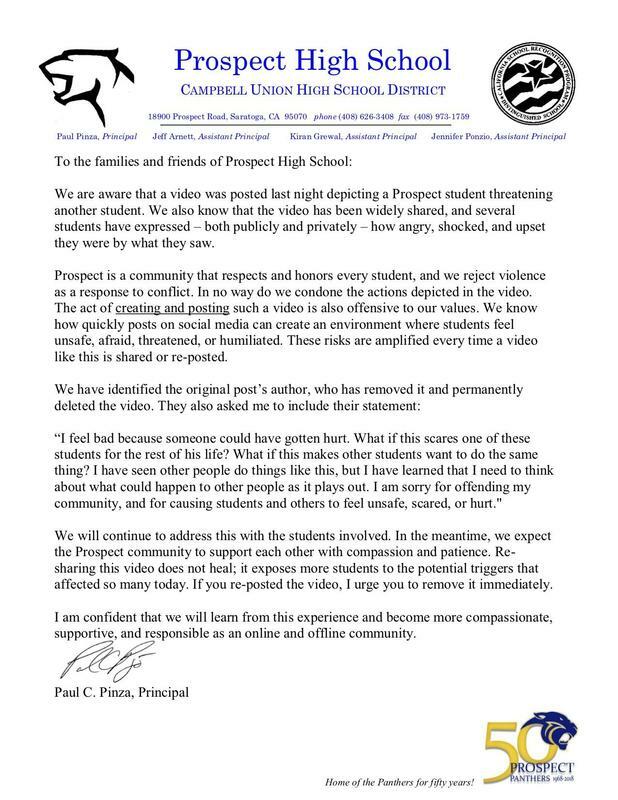 Prospect is a community that respects and honors every student, and we reject violence as a response to conflict. In no way do we condone the actions depicted in the video. The act of creating and posting such a video is also offensive to our values. We know how quickly posts on social media can create an environment where students feel unsafe, afraid, threatened, or humiliated. These risks are amplified every time a video like this is shared or re-posted. “I feel bad because someone could have gotten hurt. What if this scares one of these students for the rest of his life? What if this makes other students want to do the same thing? I have seen other people do things like this, but I have learned that I need to think about what could happen to other people as it plays out. I am sorry for offending my community, and for causing students and others to feel unsafe, scared, or hurt." We will continue to address this with the students involved. In the meantime, we expect the Prospect community to support each other with compassion and patience. Re-sharing this video does not heal; it exposes more students to the potential triggers that affected so many today. If you or someone you know re-posted the video, I urge you to remove it immediately. I am confident that we will learn from this experience and become more compassionate, supportive, and responsible as an online and offline community.